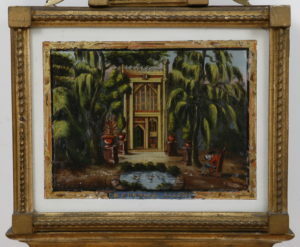 Currier was born in Hopkinton New Hampshire on May 4, 1793. He lived long and active life and died in Salem, Massachusetts on May 17, 1853.Edmund manufactured and repaired tools, wagons, sleighs and harness. He was also a fine clockmaker and repaired some watches. 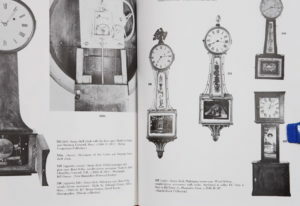 A small number of clocks are listed as being made in this New Hampshire location. Edmund moved from Hopkinton in 1825 to the corner of Essex and Central Streets in Salem, Massachusetts. 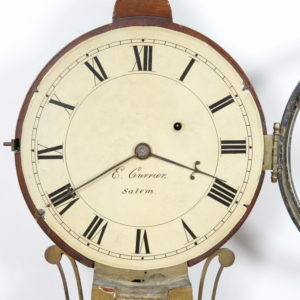 In 1828, he moved relocated to 7 Derby Square, centrally located “In the market.” This is a very nice second generation timepiece with original reverse glass paintings and original signed painted iron dial. The brass eight day weight driven timepiece has typical period details including a single bridge suspension, steel crutch, recoil escapement, and rear center bolt mounting. 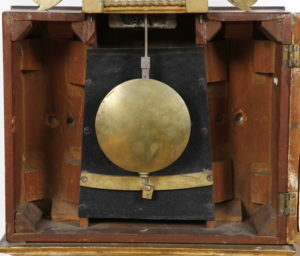 The original cast lead iron weight and pulley power the clock. The throat glass is original and in the lower section of the tablet the decoration includes “PATENT.” The box tablet is signed by the maker. The bracket is original to the case and the weight has never gone through the bottom. 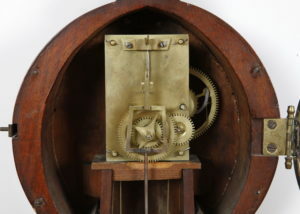 Here is a chance to own a documented clock: # 536 in The American Clock by Distin & Bishop. 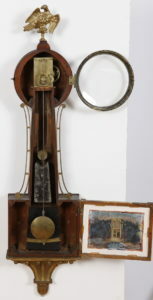 The clock comes with provenance from the well known collection of Buzz Burroughs and it was acquired through Herschel B. Burt. The hands, dial, movement, weight & pendulum are all original to the clock and the movement has been serviced and keeps perfect time. The frames & bezel are original as well as the side arms and chimney. The brass eagle is an old replacement, and there is an old coat of protective sealer on the dial that has mellowed to a golden color. 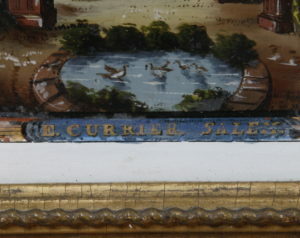 Both glasses are original with minor conservation of the white background, in-painting from the back. The lower box is extremely clean with undisturbed weight pan, tie down and wonderful original glue blocks. Note also the original tapered wooden guides in the upper part of the weight channel ! These are often broken/missing/replaced on most period timepieces. All in all a wonderful gold front presentation timepiece.